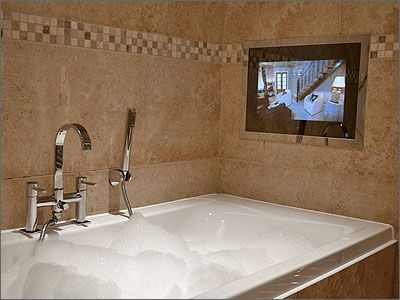 TileVision is a waterproof mirror LCD TV, wide-screen format with 170° viewing angle. When TV is off, it’s just a mirror. TileVision uses high brightness LCD screens with a high contrast ratio of 800:1. It is totally waterproof and tamperproof, and screen is made from 6mm thick toughened safety glass. The screen is heated to keep it clear of condensation. TileVision is perfect for use in high humidity areas such as bathrooms, kitchens, pool/jacuzzi areas and even spa rooms – they see it as the ‘must have’ bathroom appliance of the future. Included are 30 button waterproof remote control, most common inputs/outputs and an internal stereo FM radio. Nicam stereo sound output via two waterproof 5” flush mounted speakers is optional. 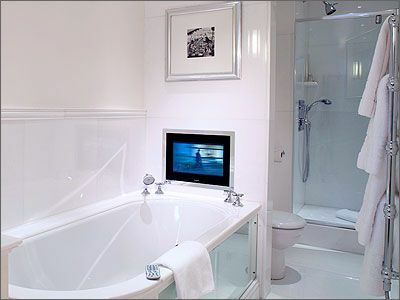 This mirror TV is available in Mirror, Black and Silver finish and can fit any bathroom decor.